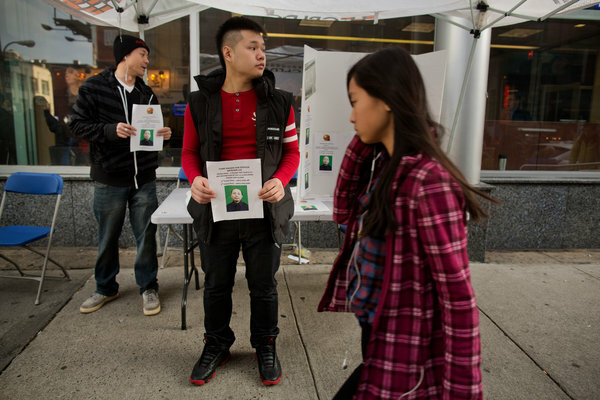 Volunteers gathered donations for the family of Officer Wenjian Liu in Chinatown on Sunday. 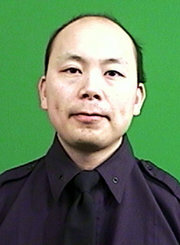 He is believed to be the first Chinese-American police officer killed in the line of duty in New York. The funeral on Sunday for Wenjian Liu, who is believed to be the first Chinese-American police officer killed in the line of duty in New York, will have all the trappings that the city’s traditions demand. Thousands of officers in pressed navy blue. A Police Department flag covering the coffin. A eulogy from the mayor. But the ceremony will also include a tradition unfamiliar to the Police Department. While the services last weekend for Officer Rafael Ramos, who died alongside Officer Liu in an ambush in Brooklyn on Dec. 20, were held at a church, Officer Liu will be honored at a funeral home with Buddhist monks praying. Mourners will burn ceremonial paper money and objects in front of his photograph — riches, according to Chinese custom, for the afterlife. The fact that Officer Liu’s burial will include both sets of customs is proof of how diverse the city’s police ranks have become since the not-too-distant days when uniformed funerals were reliably Roman Catholic affairs. Yet it is a sign, too, of how wide the gap still is between one of the city’s oldest institutions and one of its fastest-growing immigrant communities. Officer Liu, 32, will be commemorated at Aievoli Funeral Home in Bensonhurst, Brooklyn, a former Italian stronghold that has given more and more ground in recent years to Chinese immigrants. A police ceremony with a police chaplain and eulogies will follow a Chinese ceremony led by Buddhist monks. Afterward, a procession will carry Officer Liu to Cypress Hills Cemetery, at a site chosen with the help of a feng shui expert. Besides Mayor Bill de Blasio and Police Commissioner William J. Bratton, an official list of who will speak at the funeral has not been announced. The Chinese ceremony will be “very quiet and private,” said Joseph Aievoli, the funeral home’s owner, making it unlikely that officers and dignitaries will attend that service. Several family friends have said they plan to attend only the wake on Saturday, intimidated by what is sure to be a large showing by the Police Department on Sunday. The blending will be complex. Some in Brooklyn’s Chinatown, which has expanded from Sunset Park to nearby Borough Park and Bensonhurst, are wary of authority figures like the police, in part because of some Chinese immigrants’ murky legal statuses. Cultural and language barriers have bred such deep insularity that many in the Liu family’s circle seemed in recent days to be only dimly aware of the city’s policing controversy. The family members, some of whom do not speak English, have turned to Chinese police officers who have been assigned to support them, acting as linguistic and cultural translators. A community affairs officer who speaks Cantonese and a lieutenant in the department’s employee relations section who speaks Taishanese, the family’s native dialect, have been constant presences. Police officers guard their home. The news media has hovered. Dignitaries including Vice President Joseph R. Biden Jr., the mayor, the police commissioner and Gov. Andrew M. Cuomo have stopped in. Friends who have spoken with the family say Officer Liu’s parents are moved, but dazed, by the attention and the high-profile visits. The family’s only public comment came from Officer Liu’s widow, Pei Xia Chen, who married Officer Liu in September. She gave a tearful statement two days after the shooting. One complication of the funeral planning has been picking an auspicious day under Chinese tradition. Another involves accommodating the many people who did not know Officer Liu but want to attend, prompting the Police Department to set up community viewing areas. Also, the service had to be delayed until relatives from China could obtain travel documents to the United States and fly to New York. Little in the rituals of a police funeral will be familiar to Officer Liu’s relatives. At a traditional Chinese funeral, mourners wail and sob throughout. Some fall prostrate on the ground. Many attendees pay their respects and leave, rather than staying for the full service. Eulogies are not usually given. Officer Liu was not the first Asian-American police officer to die in the line of duty; Officer Kevin Lee of the Bronx died of a heart attack while pursuing a suspect in 2006, and Detective Richard J. Guerzon, who was of Filipino descent, was shot with his partner while driving a prisoner to Rikers Island in 1989. But Officer Liu’s is the first funeral that Lieutenant Giorgio can recall that will incorporate Chinese traditions. The robot up for grabs is a Kids Walker Cyclops model by Sakakibara Kikai. If money is a problem or if you’re one of those crazy people who doesn’t want to walk around town in a huge robot, Keisei Department Store is offering a wide selection offukubukuro this year such as gold coins, noodles, bungee jumping experiences, and a mysterious lucky bag offering a marriage proposal to a loved one, which is valued between 1,000 and 1,000,000 yen ($8.40 – $8,400). Have you ever doodled in the dirt on your car before you finally got around to washing it? Or perhaps when you were younger you wrote something rude in the dust on the neighbour’s rear window? American artist Scott Wade took his doodling many steps further and now creates this stunning Dirty Car Art that you’d never want to wash off. Born and raised in the US, Scott is an artist and musician who has spent his life nurturing his creativity. He discovered Dirty Car Art as he was living on a long dirt road in Texas where his cars were always covered in dust and grime. His natural instinct was always to doodle in the dust, and this led to him experimenting with various techniques, and eventually evolved into the art we see from him today which he’s been working on since 2003. It’s reminiscent of the chalk art that’s popular in Japan right now with the use of subtle shading to create almost photographic realism. Of course when turning up to work at a fancy motor event it’s unlikely that any of the cars there will be waiting for him covered in dirt. While he prefers to work on ‘natural’ canvases, in other words cars that have got really dirty from driving for miles along dry dirt roads, he has also developed a technique for creating an ‘artificial’ canvas. The simple process involves spreading a thin, even layer of oil over the window then using a hair dryer to blow handfuls of fine dirt or other powder across the whole thing, which sounds easy enough for anyone to do. The hard part is the bit where you actually have to be able to draw. ▼Here is a recreation of the iconic woodblock print The Great Wave off Kanagawa by Hokusai from his Thirty-six Views of Mount Fuji series that Scott created for Japanese television. ▼Another piece done for a Japanese TV show, this time featuring a heron. ▼He was commissioned to draw this fantastic dragon for a Nokia commercial. And it’s not just oriental styles – Scott creates a wide range of scenes from his own original work to incredible recreations of familiar and famous pieces. Check them out below. ▼A recreation of English romantic painter John Constable’s The Hay Wain. ▼A beautiful wildflower meadow created for a South Korean TV show. ▼He drew a car on his car! Xzibit would be proud. ▼One of C.M. Coolidge’s famous paintings of dogs playing poker. ▼And last but not least, something seasonal. You can see more from Scott over at his official website. And next time you think your car really could do with a clean, why not have a little doodle on it beforehand? If it goes terribly then you can wash away all the evidence! South Koreans now drink more coffee than they eat their staple food rice, according to a survey conducted by the Korea Centers for Disease Control of 3,805 adults, according to The Chosun Ilbo. According to the 2013 survey, the average Korean drinks coffee 12.3 times per week, followed by eating kimchi 11.8 times, multigrain rice 9.5 times, and white rice seven times per week. The proportion of rice in Koreans’ daily diet has steadily declined over the past decade whereas coffee-related calorie intake has quadrupled due to the amount of artificial sweeteners in coffee, reported The Korea Herald. Over the past few years, coffee culture has been going strong in South Korea. Earlier this year, Seoul was named as the city with the most Starbucks locations, beating New York City and Los Angeles. In addition, it was reported last month that Starbucks in Korea costs twice as much as it does in the U.S.